A British writer with whom the poet spent her last weekend perceptively details her final days while offering her own insights into Plath’s death, marriage, and ambitions. Plath has become an icon, polarizing friends and family as well as admirers, and Becker tries to set the record straight, as she sees it. She believes feminists have falsely hijacked Plath for their cause, failing to recognize that the intensely ambitious poet never “scorned the traditional woman’s role of wife and mother, homemaker and housekeeper.” Becker begins with the bitterly cold Thursday afternoon in February 1963 when Plath phoned and asked if she and her children could visit. Once there, she asked if they could stay overnight. As the two women’s children played, Plath talked bitterly of Assa Wevill, the woman her estranged husband, fellow poet Ted Hughes, was living with. Later, she asked Becker to sit by her bed until she fell asleep, showing her the two bottles of pills and their instructions: two from one bottle at bedtime, two from the other on waking. Saturday night, Plath dressed up and went out to meet someone; Becker speculates it might have been Hughes, seeking a reconciliation. The author details in measured prose the family’s Sunday lunch and Plath’s request that Becker’s husband Gerry take her and the children home afterwards. Her host wasn’t overly concerned: Plath seemed cheerful at lunch, and Becker agreed with the poet’s doctor that the need to take care of her children would keep her alive. She also admits to being tired of coping with Plath, whose need for her attention was relentless and exhausting. 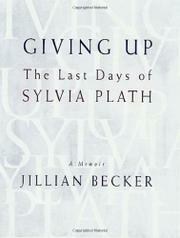 In the remaining chapters, Becker ponders the poet’s reasons for taking her life, speculating that a sense of losing her gift might have been as much a factor as her failed marriage. Addressing the myths that have grown up around her friend, Becker wants to reclaim the part not consumed by Plath’s ambition. Thoughtful and intelligent: a welcome corrective to the legend.